Thermocouple amplifier providing high accuracy temperature measurement in range of 0-1250°C. It converts thermocouple type-k non-linear milivolts signal to 0-5V linear (4mV/°C) output. 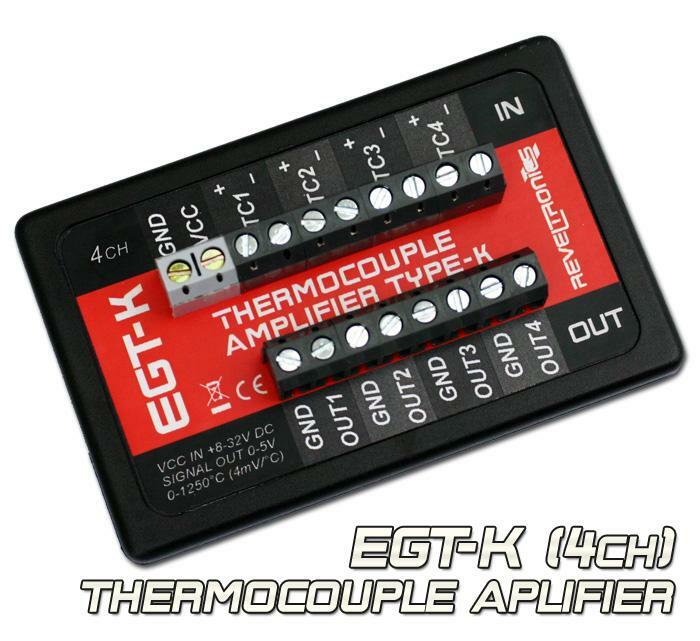 EGT-K is a precision thermocouple amplifier providing high accuracy temperature measurement in range of 0-1250°C. It converts thermocouple type-k non-linear milivolts signal to 0-5V linear (4mV/°C) output so it's compatible with most industrial applications and data-loggers. It has built-in cold junction compensation so any length wires can be used. EGT-K is available in single, dual or quad channel variant. Full product description in menu "Products -> EGT-K". Please use any type "K" thermocouples as input sensors. We have also in offer EGT-K with different number of channels. There is possibility to modify our product for your needs (e.g. more channels, type-J instead of type-K, different enclosure, IP65 standard etc.) - please contact us. Milan · 6 months ago. Andy · 1 years ago. eshgr · 2 years ago. deanb84 · 2 years ago. martijnus · 2 years ago.